Let’s do a short recap: I really liked the first one, but thought that the great spy-plot was in conflict with the more over-the-top, ridiculous action bits (say: Channel Tunnel). The second one was incredibly disappointing, and a complete disaster. Part 3 was a return to form, mostly thanks to a better script and the best villain in the series so far. “Ghost Protocol” was another step up for the series, with some incredible, breathtaking action sequences (Burj Khalifa), which only got bogged down by a weak bad guy and an underwhelming finish. Overall, I wouldn’t say that I’m the biggest fan of the series, but with the exception of the first one, I saw all of them in the theatre, and apart from Woo’s entry, never regretted that decision. I would need to watch the whole series again to be absolutely sure, but “Rogue Nation” might actually – by a narrow margin – be the best one so far. What I found most interesting about it is that, after mostly following the “bigger and greater”-Hollywood-formula for sequels, this one actually felt less action-y than the last ones, and seemed to hark back more to the first one (which was more spy thriller than action movie). I was also really astonished when I noticed that the biggest and most impressive action sequence, that also was front and center in the marketing campaign, actually happens in the first couple of minutes of the movie. More than anything, that definitely had me intrigued, because if they thought that they could start with this stunning sequence without being afraid that what would follow afterwards would feel like a letdown, I couldn’t wait to see what they had in store for us. Thankfully, the rest of the movie didn’t disappoint – and I’m really impressed that Christopher McQuarrie, Tom Cruise, and the whole production team had enough confidence in the cinemagoers to afterwards rely mostly on a thrilling, compelling story with numerous twists and turns, instead of one bloated action scene after another (which is not to say that the action afterwards wasn’t also very well done, and quite gripping, be it the break-in or the motorcycle chase; but it was a lot more grounded than I’ve come to expect from movies like that, and even compared to the previous entries in the series). There’s a confidence and a self-assuredness to it all that I found quite impressive. Apart from that, as well as that stunning first action sequence, the main standout of the movie definitely is Ilsa Faust. Played to perfection and with incredible charm and charisma by Hollywood-newcomer Rebecca Ferguson (a star-making performance if I’ve ever seen one), she is the heart and soul of the movie, and very much at its centre. Like another of this years blockbusters, “Mad Max: Fury Road”, she’s the driving force behind most of what happens in the movie, with the male lead mostly being there for the ride. I loved absolutely everything about that character, and her performance, but it was especially great that she actually followed her own interest (instead of being there to offer incentive for the male lead, or to simply tag along), and that she could stand her own, and didn’t depend on Ethan Hunt to save her (actually, in a great twist of formula, its actually the other way around here). The villian, Solomon Lane, also was definitely a huge step up from the disappointing baddie in “Ghost Protocol” – even though he still wasn’t quite as impressive as I would have liked, let alone nearly charismatic and menacing as the unforgettable Philip Seymour Hoffman in “Mission Impossible III”. However, I liked that he had a reasonable and understandable agenda (and motivation) of his own, and that he offered a mental challenge for Hunt, rather than a psychical one. And I just loved the outcome of their contest, which mirrored a scene from the beginning. That was mightily clever, and a welcome change from how movies like that usually end. Another thing that stood out for me – understandably – was the portion of it that played in my own home town in Vienna. While movie fans in America, especially when they live in one of the major cities like LA, NY or SF, should be very familiar with seeing their home turf in a Hollywood blockbuster, it’s a rather rare feeling for me. I especially loved the prolonged sequence at the opera, which not only used that location perfectly, but also was one of the most gripping scenes of the movie in itself. Anyway, given all that, I’m more than happy to overlook the geographical error of having Benji get out at Schottenring station and walk out of Karlsplatz station (He probably beamed himself over there 😉 ). I also really loved the credits sequence, with its short glimpses of the things to come. It’s been far too long since I saw it but wasn’t that something that they also did on the classic tv show? Anyway, I felt that this was a nice touch. Finally, I found Joe Kraemer’s approach to scoring this movie interesting. It almost seemed like the opposite of what they to with the Bond-theme in 007 movies recently, where they usually only play it during specific scenes, and then during the end credits (while at the beginning, you usually only hear the first notes of it). Here, the well-known MI-theme can be heard during the opening credits, and is then pretty much ever-present all through the movie; however, only in a shortened, slightly varied version which never reaches its crescendo. The full theme is only heard again during the end credits. I still don’t know if I liked that or not, but as I said, as a score-buff, I found it interesting to compare this approach to the recent Bonds. Apart from the still-not-overly-impressive villain, one or two rather predictable twists, the fact that it drags marginally from the end of act two to the middle of act three, and said musical approach, though, “Rogue Nation” definitely accomplished its mission. 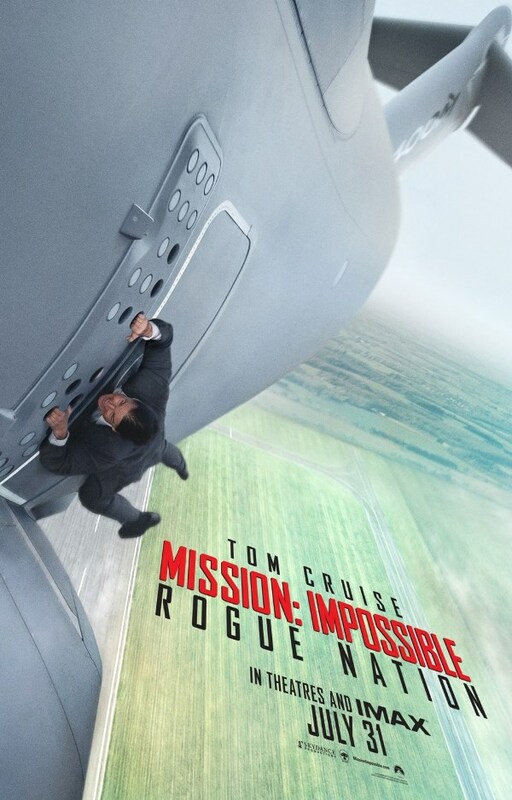 This entry was posted in cinema 2015, movie reviews, new releases and tagged action, Christopher McQuarrie, Jeremy Renner, MIssion: Impossible, Rebecca Ferguson, Rogue Nation, Sean Harris, Simon Pegg, spy, thriller, Tom Cruise, Ving Rhames. Bookmark the permalink.